Preface, Third Edition. Acknowledgements. 1. Introduction. Physical and mathematical models. Models as a management tool. Models as a scientific tool. Models and holism. The ecosystem as an object for research. Outline of the book. The development of ecological and environmental models. State of the art in the application of models. 2. Concepts of Modelling. Introduction. Modelling elements. The modelling procedure. Types of model. Selection of the model type. Selection of model complexity and structure. Verification. Sensitivity analysis. Parameter estimation. Validation. Ecological modelling and quantum theory. Modelling constraints. Problems. 3. Ecological Processes. Space and time resolution. Mass transport. Mass balance. Energetic factors. Settling and resuspension. Chemical reactions. Chemical equilibrium. Hydrolysis. Redox. Acid-Base. Adsorption and ion exchange. Volatilization. Biogeochemical cycles in aquatic environments. Photosynthesis. Algal growth. Zooplankton growth. Fish growth. Single population growth. Ecotoxicological processes. Problems. 4. Conceptual Models. Introduction. Application of conceptual diagrams. Types of conceptual diagrams. The conceptual diagram as modelling tool. Problems. 5. Static Models. Introduction. Network models. Network analysis. ECOPATH software. Response models. 6. Modelling Population Dynamics. Introduction. Basic concepts. Growth models in population dynamics. Interaction between populations. Matrix models. Problems. 7. Dynamic Biogeochemical Models. Introduction. Application of dynamic models. Eutrophication models I: Overview and two simple eutrophication models. Eutrophication models II: A complex eutrophication model. A wetland model. Problems. 8. Ecotoxicological Models. Classification and application of ecotoxicological models. Environmental risk assessment. Characteristics and structure of ecotoxicological models. An overview: The application of models in ecotoxicology. Estimation of ecotoxicological parameters. Ecotoxicological case study I: Modelling the distribution of chromium in a Danish fjord. Ecotoxicological case study II: Contamination of agricultural products by cadmium and lead. Ecotoxicological case study III: A mercury model for Mex Bay, Alexandria. Fugacity fate models. Problems. 9. Recent Developments in Ecological and Environmental Modelling. Introduction. Ecosystem characteristics. Structurally dynamic models. Four illustrative structurally dynamic case studies. Application of chaos theory in modelling. Application of catastrophe theory in ecological modelling. New approaches in modelling techniques. Problems. Appendix 1. Mathematical Tools. Vectors. Matrices. Square matrices, eigenvalues and eigenvectors. Differential equations. Systems of differential equations. Numerical methods. Appendix 2. Definition of Expressions, Concepts and Indices. Appendix 3. Parameters for Fugacity Models. References. Subject Index. 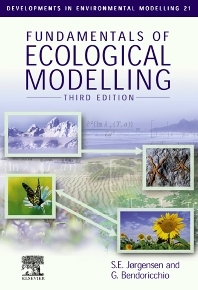 This is a thoroughly revised and updated edition of an authoritative introduction to ecological modelling. Sven Erik Jørgensen, Editor-in-Chief of the journal Ecological Modelling, and Giuseppe Bendoricchio, Professor of Environmental Modelling at the University of Padova, Italy, offer compelling insights into the subject. This volume explains the concepts and processes involved in ecological modelling, presents the latest developments in the field and provides readers with the tools to construct their own models. • A detailed discussion and step-by-step outline of the modelling procedure. • An account of different model types including overview tables, examples and illustrations. • A comprehensive presentation of the submodels and unit processes used in modelling. • In-depth descriptions of the latest modelling techniques. • Structured exercises at the end of each chapter. • Three mathematical appendices and a subject index. This practical and proven book very effectively combines the theory, methodology and applications of ecological modelling. The new edition is an essential, up-to-date guide to a rapidly growing field.